Ice cream for dinner! Hey! Don’t judge. It’s out right now….at least by Michigan standards. A co-worker and I were in Muskegon for the evening and neither one of us was really hungry. We were driving around town picking up some things at different locations when she asked if there was an ice cream place nearby. I had no idea. I know a little bit about Muskegon, but for the most part, I have to Google everything, so that’s what I did. No ice cream place came up near where we were, but a couple came up about ten minutes away. I figured, “What the heck?” We had the time and how can you say no to ice cream for dinner. We started heading down Sherman Boulevard in search of ice cream. Not long after we passed McCracken Street, I noticed a large group gathered around what looked like a barn. 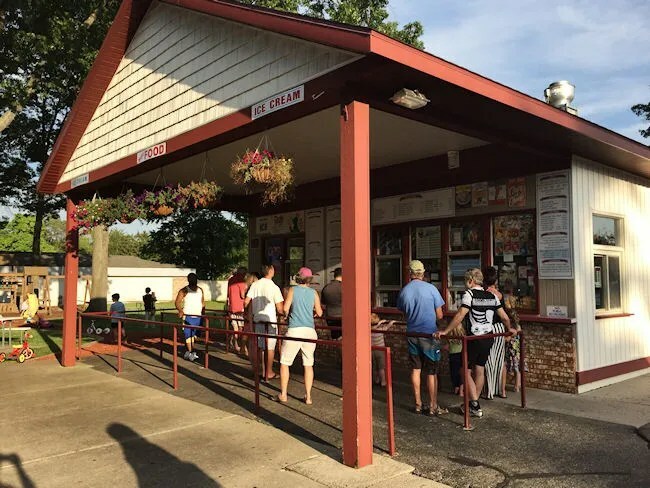 That many people in the same place on a hot day almost always means there’s ice cream. Frosty Oasis is a pretty large season stand. They have a huge ice cream menu, but they have almost equally as impressive food money. Nothing fancy, mind you, but lots to choose from. C.W. and I got in line behind a couple of kids who really don’t know how a queue works. They were just hanging out with lots of space between them and the people in front of them. Only one of the three windows had someone ordering. Finally one of the ladies working in the stand peaked out and asked to help the next person in line. C.W. was in front of me, so when we got to the front, I let her go. It turns out, we ordered almost the same thing anyway. We both ordered medium Reese’s Peanut Butter Cup Flurries. The only difference being that I added some food to my order and she just stuck with ice cream. The flurries came out first. Typically flurry. 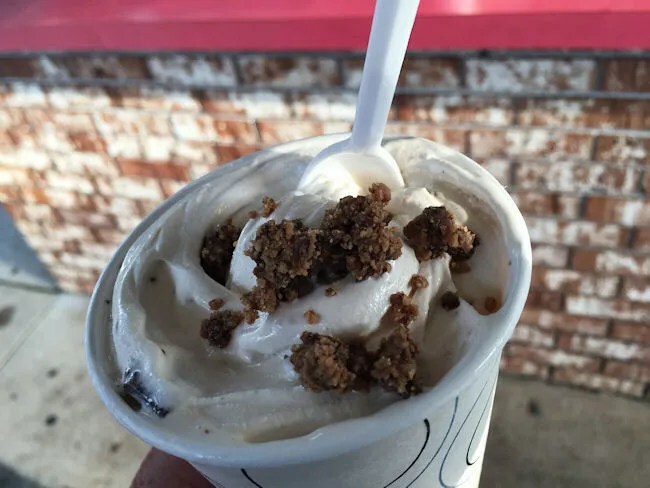 Vanilla soft serve ice cream with peanut butter cup pieces. C.W. said it could have used more candy and I’m going to agree with her. They went a little lit on the peanut butter cups. 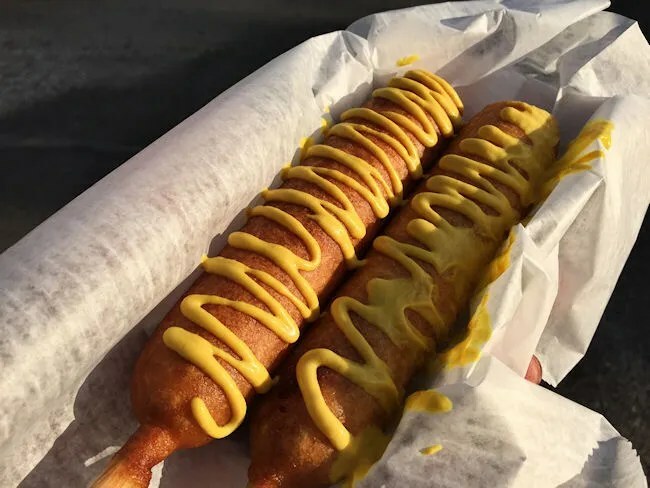 As for food, I ordered two Pronto Pups. Pronto was not quite the right word here. It took five to ten minutes for the dogs to be fried up, but at least I know they were coming out hot. I opted to just put mustard on mine instead of the usual mustard and ketchup. The Pronto Pups were large and really good, but not quite the same as the Grand Haven Pronto Pup stand that sells them. The cost for my two Pronto Pups and a flurry was just under $10. Not a bad price at all for what turned out to be a really filling meal. 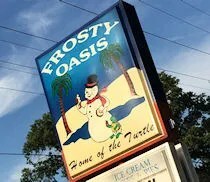 The big complaint about Frosty Oasis for us was speed of service. There weren’t really any other people in line, but it still took quite a while to get ordered and get all of our food. We were really just in the market for a quick stop so we could continue on with our task. We got what we were looking for…it just took a little longer than expected.